Paul Adrien Maurice Dirac OM FRS ( ; 8 August 1902 – 20 October 1984) was an English theoretical physicist who made fundamental contributions to the early development of both quantum mechanics and quantum electrodynamics. He was the Lucasian Professor of Mathematics at the University of Cambridge, a member of the Center for Theoretical Studies, University of Miami, and spent the last decade of his life at Florida State University. Among other discoveries, he formulated the Dirac equation, which describes the behaviour of fermions and predicted the existence of antimatter. Dirac shared the Nobel Prize in Physics for 1933 with Erwin Schrödinger, "for the discovery of new productive forms of atomic theory". He also did work that forms the basis of modern attempts to reconcile general relativity with quantum mechanics. He was regarded by his friends and colleagues as unusual in character. Albert Einstein said of him, "This balancing on the dizzying path between genius and madness is awful". His mathematical brilliance, however, means he is regarded as one of the most significant physicists of the 20th century. Dirac was educated first at Bishop Road Primary School and then at the all-boys Merchant Venturers' Technical College (later Cotham School), where his father was a French teacher. The school was an institution attached to the University of Bristol, which shared grounds and staff. It emphasised technical subjects like bricklaying, shoemaking and metal work, and modern languages. This was unusual at a time when secondary education in Britain was still dedicated largely to the classics, and something for which Dirac would later express gratitude. Dirac was known among his colleagues for his precise and taciturn nature. His colleagues in Cambridge jokingly defined a unit of a "dirac", which was one word per hour. When Niels Bohr complained that he did not know how to finish a sentence in a scientific article he was writing, Dirac replied, "I was taught at school never to start a sentence without knowing the end of it." He criticised the physicist J. Robert Oppenheimer's interest in poetry: "The aim of science is to make difficult things understandable in a simpler way; the aim of poetry is to state simple things in an incomprehensible way. The two are incompatible." Another story told of Dirac is that when he first met the young Richard Feynman at a conference, he said after a long silence "I have an equation. Do you have one too?". After he presented a lecture at a conference, one colleague raised his hand and said "I don't understand the equation on the top-right-hand corner of the blackboard". After a long silence, the moderator asked Dirac if he wanted to answer the question, to which Dirac replied "That was not a question, it was a comment." Dirac did not commend himself to any definite view, but he described the possibilities for answering the question of God in a scientific manner. Dirac shared the 1933 Nobel Prize for physics with Erwin Schrödinger "for the discovery of new productive forms of atomic theory". Dirac was also awarded the Royal Medal in 1939 and both the Copley Medal and the Max Planck Medal in 1952. He was elected a Fellow of the Royal Society in 1930, an Honorary Fellow of the American Physical Society in 1948, and an Honorary Fellow of the Institute of Physics, London in 1971. Dirac became a member of the Order of Merit in 1973, having previously turned down a knighthood as he did not want to be addressed by his first name. 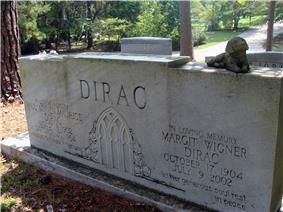 Dirac's grave in Roselawn cemetery, Tallahassee, Florida. Also buried is his wife Manci (Margit Wigner). He quantised the gravitational field, and developed a general theory of quantum field theories with dynamical constraints, which forms the basis of the gauge theories and superstring theories of today. The influence and importance of his work has increased with the decades, and physicists daily use the concepts and equations that he developed. Dirac's first step into a new quantum theory was taken late in September 1925. Ralph Fowler, his research supervisor, had received a proof copy of an exploratory paper by Werner Heisenberg in the framework of the old quantum theory of Bohr and Sommerfeld, which leaned heavily on Bohr's correspondence principle but changed the equations so that they involved directly observable quantities. Fowler sent Heisenberg's paper on to Dirac, who was on vacation in Bristol, asking him to look into this paper carefully. Dirac's attention was drawn to a mysterious mathematical relationship, at first sight unintelligible, that Heisenberg had reached. Several weeks later, back in Cambridge, Dirac suddenly recognised that this mathematical form had the same structure as the Poisson Brackets that occur in the classical dynamics of particle motion. From this thought he quickly developed a quantum theory that was based on non-commuting dynamical variables. This led him to a more profound and significant general formulation of quantum mechanics than was achieved by any other worker in this field. Dirac noticed an analogy between the Poisson brackets of classical mechanics and the recently proposed quantisation rules in Werner Heisenberg's matrix formulation of quantum mechanics. This observation allowed Dirac to obtain the quantisation rules in a novel and more illuminating manner. For this work, published in 1926, he received a PhD from Cambridge. In 1928, building on 2×2 spin matrices which he discovered independently of Wolfgang Pauli's work on non-relativistic spin systems, (Abraham Pais quoted Dirac as saying "I believe I got these (matrices) independently of Pauli and possibly Pauli got these independently of me") he proposed the Dirac equation as a relativistic equation of motion for the wave function of the electron. This work led Dirac to predict the existence of the positron, the electron's antiparticle, which he interpreted in terms of what came to be called the Dirac sea. The positron was observed by Carl Anderson in 1932. Dirac's equation also contributed to explaining the origin of quantum spin as a relativistic phenomenon. The necessity of fermions (matter being created and destroyed in Enrico Fermi's 1934 theory of beta decay), however, led to a reinterpretation of Dirac's equation as a "classical" field equation for any point particle of spin ħ/2, itself subject to quantisation conditions involving anti-commutators. Thus reinterpreted, in 1934 by Werner Heisenberg, as a (quantum) field equation accurately describing all elementary matter particles – today quarks and leptons – this Dirac field equation is as central to theoretical physics as the Maxwell, Yang–Mills and Einstein field equations. 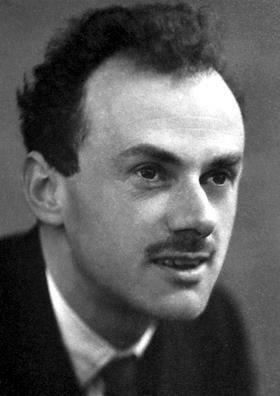 Dirac is regarded as the founder of quantum electrodynamics, being the first to use that term. He also introduced the idea of vacuum polarisation in the early 1930s. This work was key to the development of quantum mechanics by the next generation of theorists, and in particular Schwinger, Feynman, Sin-Itiro Tomonaga and Dyson in their formulation of quantum electrodynamics. Dirac's Principles of Quantum Mechanics, published in 1930, is a landmark in the history of science. It quickly became one of the standard textbooks on the subject and is still used today. In that book, Dirac incorporated the previous work of Werner Heisenberg on matrix mechanics and of Erwin Schrödinger on wave mechanics into a single mathematical formalism that associates measurable quantities to operators acting on the Hilbert space of vectors that describe the state of a physical system. The book also introduced the delta function. Following his 1939 article, he also included the bra–ket notation in the third edition of his book, thereby contributing to its universal use nowadays. In 1933, following his 1931 paper on magnetic monopoles, Dirac showed that the existence of a single magnetic monopole in the universe would suffice to explain the observed quantisation of electrical charge. In 1975, 1982, and 2009 intriguing results suggested the possible detection of magnetic monopoles, but there is, to date, no direct evidence for their existence (see also Magnetic monopole#Searches for magnetic monopoles). 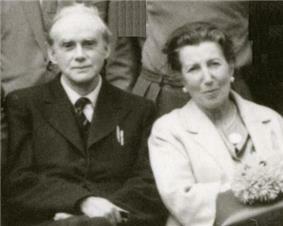 Amongst his many students was John Polkinghorne, who recalls that Dirac "was once asked what was his fundamental belief. He strode to a blackboard and wrote that the laws of nature should be expressed in beautiful equations." The Dirac-Hellman Award at Florida State University was endowed by Dr Bruce P. Hellman in 1997 to reward outstanding work in theoretical physics by FSU researchers. The Paul A.M. Dirac Science Library at Florida State University, which Manci opened in December 1989, is named in his honour, and his papers are held there. Outside is a statue of him by Gabriella Bollobás. The street on which the National High Magnetic Field Laboratory in Tallahassee, Florida, is located was named Paul Dirac Drive. As well as in his home town of Bristol, there is also a road named after him in Didcot Oxfordshire, Dirac Way. The BBC named a video codec, Dirac, in his honour. ^ Sukumar, N. (2012). A Matter of Density: Exploring the Electron Density Concept in the Chemical, Biological, and Materials Sciences. John Wiley & Sons. p. 27. ^ Kim, Y.A. (1995). "Wigner's Sisters". Retrieved 4 April 2013. ^ Farmelo 2009, p. 138, who says this was an old joke, pointing out in a footnote that Punch wrote in the 1850s that "There is no God, and Harriet Martineau is her prophet. ^ a b c Helge Kragh (1990). "The purest soul". Dirac: A Scientific Biography. Cambridge University Press. pp. 256–257. ^ a b "Dirac takes his place next to Isaac Newton". Florida State University. Retrieved 4 April 2013. ^ Behram N. Kursunoglu and Eugene Paul Wigner (ed.). Reminiscences about a Great Physicist. Cambridge University Press. p. 98. ^ Dirac, P. A. M. (1 February 1928). "The Quantum Theory of the Electron". Proceedings of the Royal Society of London. Series A, Containing Papers of a Mathematical and Physical Character 117 (778): 610–24. ^ Dirac, Paul (12 December 1933). "Theory of electrons and positrons". 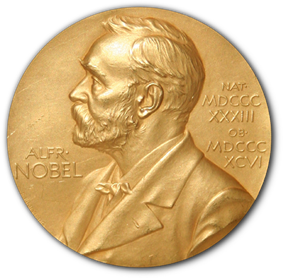 Nobel Lecture. Retrieved 13 May 2013. ^ P. A. M. Dirac (1939). "A New Notation for Quantum Mechanics". Proceedings of the Cambridge Philosophical Society 35 (3): 416. ^ Gieres (2000). "Mathematical surprises and Dirac's formalism in quantum mechanics". Reports on Progress in Physics 63 (12): 1893. ^ P. B. Price; E. K. Shirk; W. Z. Osborne; L. S. Pinsky (25 August 1975). "Evidence for Detection of a Moving Magnetic Monopole". Physical Review Letters (American Physical Society) 35 (8): 487–90. ^ Blas Cabrera (17 May 1982). "First Results from a Superconductive Detector for Moving Magnetic Monopoles". Physical Review Letters (American Physical Society) 48 (20): 1378–81. ^ D.J.P. Morris, D.A. Tennant, S.A. Grigera, B. Klemke, C. Castelnovo, R. Moessner, C. Czternasty, M. Meissner, K.C. Rule, J.-U. Hoffmann, K. Kiefer, S. Gerischer, D. Slobinsky, and R.S. Perry (3 September 2009). "Dirac Strings and Magnetic Monopoles in Spin Ice Dy2Ti2O7". Science 326 (5951): 411–4. ^ S. T. Bramwell, S. R. Giblin, S. Calder, R. Aldus, D. Prabhakaran & T. Fennell (15 October 2009). "Measurement of the charge and current of magnetic monopoles in spin ice". Nature 461 (7266): 956–9. ^ "Dirac Medal awards". University of New South Wales. Retrieved 4 April 2013. ^ "Undergraduate Awards". Florida State University. Retrieved 4 April 2013. ^ "Paul Adrien Maurice Dirac Collection". Florida State University. Retrieved 4 April 2013. Capri, Anton Z. (2007). Quips, Quotes, and Quanta: An Anecdotal History of Physics. Hackensack, New Jersey: World Scientific. Crease, Robert P.; Mann, Charles C. (1986). The Second Creation: Makers of the Revolution in Twentieth Century Physics. New York City: Macmillan Publishing. Kragh, Helge (1990). Dirac: A Scientific Biography. Cambridge: Cambridge University Press. Schweber, Silvan S. (1994). QED and the men who made it: Dyson, Feynman, Schwinger, and Tomonaga. Princeton, New Jersey: Princeton University Press. Zee, A. (2010). Quantum Field Theory in a Nutshell. Brown, Helen (24 January 2009). "The Strangest Man: The Hidden Life of Paul Dirac by Graham Farmelo – review [print version: The man behind the maths]". .
Gilder, Louisa (13 September 2009). "'"Quantum Leap – Review of 'The Strangest Man: The Hidden Life of Paul Dirac by Graham Farmelo. Review.